There has been a connection with Malone RFC since the 1930's with 31 members of the club joining Iris. The connection remains to this day with two of our more senior brethren deserving a special mention. Born September 1921 in Belfast, was educated at Edenderry Primary School and the Royal School Armagh. On completion of his education he joined the family firm of Craig Gardiners Accountants. Jimmy Nelson (J.E.) became a member of Irish Freemasonry over fifty years ago and has been a member of Iris Masonic Lodge 444 since April 1960. 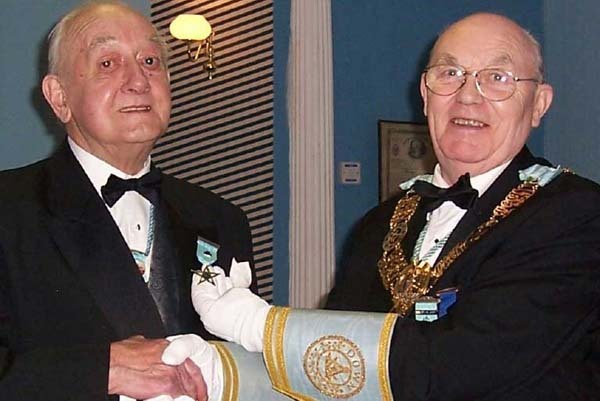 In 2006 he was presented with his 50 year Jewel by Right Worshipful Brother George Lutton. His senior rugby began in 1938/39 at Malone R.F.C. He was the club captain 1944/45 and President 1971/72. He first came to the notice of the Ulster Branch I.R.F.U. selectors in 1946, and captained his Province in 1951 and 1952 his position was playing Lock winning the first of his 16 Irish caps against Australia in 1947 and his last in Paris in 1954. A member of the Irish side in 1948 that won the “Grand Slam” against Wales at Ravenhill, Belfast. The following season he was a member of the side that won the “Triple Crown” at Swansea. In 1950 he was selected and played for the British and Irish Lions during a tour of New Zealand and Australia and also captained the Barbarians in 1958. J.E. became a member of the Irish Rugby Football Union Committee in 1962, President Ulster Branch 1968/69, Honorary Treasurer I.R.F.U. 1976/!987 and its President 1982/83. On the 16th June 1984 Her Majesty Queen Elizabeth II awarded J.E. with the O.B.E. for his services to Irish Rugby. Born in Belfast, August 1931 and was educated at Harding Memorial School and Belfast College of Technology. Will entered the printing firm of McCaw Stevenson and Orr, Belfast to train as a Lithographer. And after many years joined a leading printing company as sales representative. He then formed his own company Marjon Print and with a colleague in Dublin won the contract to print the official match program for Irish Rugby Football Union which they did for twelve years. Will was very keen on sport playing cricket for Cregagh Cricket Club and was a member of Malone Rugby Club. Will was a rugby referee for sixteen years and served eight years as Honorary Secretary to Malone Rugby Club becoming President in 1984/85. Will is a member of Cregagh Presbyterian Church and has been an Elder for over forty years. He has been a member of Irish Freemasonry for over fifty years and a member of Iris Masonic Lodge No.444 for over forty years. Will served as Worshipful Master in 1981 and in 2006 was presented with his fifty year Jewel by the Provincial Grand Master of Down, R. W. Bro Robert Armstrong. On the 24th April 2007, W. Bro George Coulter conferred an 'Entered Apprentice Degree' on Peter Warnecke. This was a very momentous occasion as Peter is the son of the Lodge Secretary, it was also the first degree conferred since the lodge had moved to the Mealough and it was conducted in the presence of the Provincial Assistant Grand Master, Right Worshipful Brother Richard Gray. A vote of thanks was passed for the excellent manner in which W.Bro Coulter conferred the degree. After the summer break of 2000 the main issue for the Lodge was the preparation for the Exemplification of a 2nd degree. W. Bro. Kettyle organised and prepared the team with comments invited from V.W. Bro. Jim Gilchrist, a Provincial Instructor from Arthur Square Class of Instruction . On a Business trip to Kenya in 1985 W. Bro. Jack Kettyle met Gordon Duncan who turned out to be the W. Master of the only Masonic Lodge within the Irish constitution in East Africa. The lodge was called Hibernia Lodge No. 749 and met in the Masonic Temple in Nairobi on the 4th Tuesday of the month, the same night as Iris 444 sits. One of Jacks colleagues Bill Harvey from Killwaughter lodge 762 was coming out to join him and Gordon very kingly invited the both of them to come along to their next meeting, as they would still be in country. They had a most enjoyable evening in wonderful surroundings and great company. If any of the members of 749 read this please convey fraternal greetings and best wishes from Bill & Jack to the Lodge.